Bonaparte and Top Of The Range represent the stable at Geelong on Sunday. Bonaparte is in race one, the 3YO C&G Maiden Plate over 1325m and to be ridden by Patrick Moloney from barrier four. “We can’t fault him looks wise and the way he is training,” Moroney said. “Ideally I’d have liked to run over a bit further but he is back against his own age. I know he has the ability to win so with ordinary luck I’m expecting him to run well. Top Of The Range (pictured) starts a new campaign in race nine, the Benchmark 78 Handicap over 1425m with Patrick Moloney to jump from barrier eight. The five-year-old son of Savabeel has prepared well. “He hasn’t got a great record first-up but we are very happy with the way he is coming up,” Moroney said. 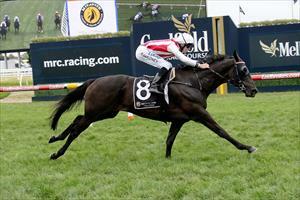 “He does look one of the best horses in the race and this is a good place to start him off.